One of the funniest situation comedies ever produced, the BBC’s 90’s phenomenon Keeping Up Appearances stands as a global hit that has kept audiences splitting their sides with laughter for the past twenty years. Hyacinth Bucket – er, make that Bouquet – and her aspirations toward an upwardly mobile station in life are absolutely legendary. And hysterically funny. Surrounded by family members and friends, both stunned by her antics and additives to her social frustrations, Hyacinth tries her best to put on a snooty face, often in the throes of embarrassment that is palatable. One of the things that makes this show such a sensation is the fact that we all have a Hyacinth in our lives. And an Onslow and a Richard and a Rose and on and on. 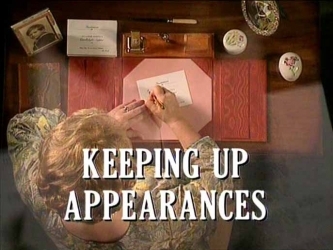 Wildly popular in the US, Keeping Up Appearances is the most successful show PBS stations have ever broadcast. It shows no signs of slowing down either. As time goes on, the reruns keep running and we keep watching as Hyacinth again and again tickles our fancy.